Last year Adam Keller and Jared Marinelli became an Internet sensation when Adam choreographed the perfect flashmob wedding proposal. They both became a 'Joy Story' as the video went viral getting 14 million hits and generating an outpouring of love and emotion from the LGBTQ and straight communities alike! Their story was filled with HOPE AND ACCEPTANCE… and the world fell in love with them both! Fast–forward 18 months to September 2017 and both Adam and Jared (#TeamJadam) have finally reached the next chapter of their story – married life! And now comes the video the world has been waiting to see… The Joy Story Wedding! The community around Adam and Jared came to their support with not just love and moral support but also with action. From the gorgeous outdoor wedding site; to the elegant signs, centerpieces, and beautiful floral arrangements; to the first-ever-wedding DJ; to their Marriage Officiant, friends and family came through in a way Adam and Jared could never have imagined. Many thanks to all who were involved in making this wedding day the best ever! The Wedding Party - Jeff, Erika, and Melissa (Team Adam) and Jonathon, Brenna, and Kimmy (Team Jared). Caterer - Liz Gagnon who is the Executive Chef at Nature's Temptations in Ridgefield, Connecticut. She and owner Jeff Konchalski (also Adam's best man) created the menu for the night… and it was delicious! Photographer - Ema Whittaker from Wilton, Connecticut. Her photos were almost as magical as the wedding itself! DJ- Jared's Brother-in-Law, Jeff "Lev" Levinson… who was playing his first wedding gig! Bravo Lev! Allison Stockel who hosted the event at her gorgeous estate and opened her home to the entire wedding party, guests, and planning team. Flo Pritchard and Cindy Tamburri who hosted the beautiful wedding shower .. and Flo who was also the wedding officiator. Amazing job Flo! And all the wedding helpers who provided their amazing skill and talents with centerpieces, flowers, signs, etc…. Stacia Howard, Lauren Mallozzi, and Jessica Sheinman. The wedding was absolutely gorgeous! "We never could have pulled this off by ourselves," said Adam through tears. And although the effort was out of love, nearly all their friends and family sensed they were serving a higher purpose than just throwing a great wedding. "The most emotional part of the day is the overwhelming love... everyone is here to celebrate and I can't even put into words what it means to me," says Jared. 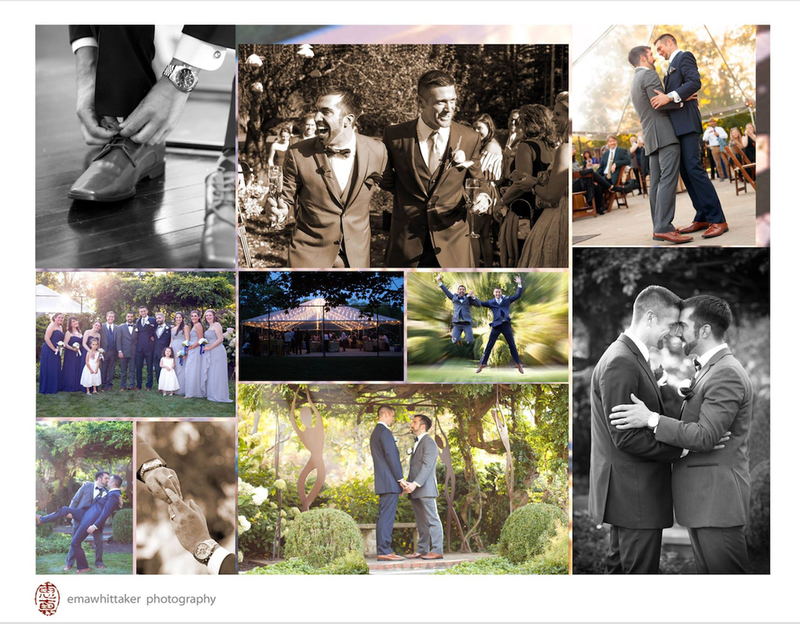 There's no doubt that their wedding day is an emotional one for Adam & Jared, especially after all the planning and anticipation these past 18 months. Now, with the ceremony just hours away, they shared with us their hopes for the day and their guests. "My wish for today is that everyone dances, smiles, has fun, and enjoys everything that we've planned out for everyone," says Jared. "Let's have a great time tonight," finishes Adam. Watch the Flashmob Wedding Proposal that started it all! This HooplaHa original video was shot by Johnny Perez + Marc Cheung and edited by Kellie Sieban. See the full wedding video at hooplaha.com. To see more inspiring love stories, follow us on Facebook and sign up for our Only Good News Newsletter.